This post has been bubbling for some time. I have stopped myself writing it more than once. However, it needs sharing. Simplicity and minimalism have become something of a trend in recent years. Many of us are over worked, over stressed, feeling we have too little time and too much stuff. We are seeking something else. We are seeking something simpler. The good news is, living simply with the right sort of less, can help us avoid this overwhelm. The problem is, these areas also have a darker side. As we become a convert to the power of simple, we bump into all sorts of challenges and internal struggles. Are you kidding me? Get over yourselves people. Are you really that desperate for some social media likes? Do you even believe your own hyperbole? Worse is when this sort of dogma comes from people that are seen as thought leaders in this space. Time to unfollow I think. Newsflash. 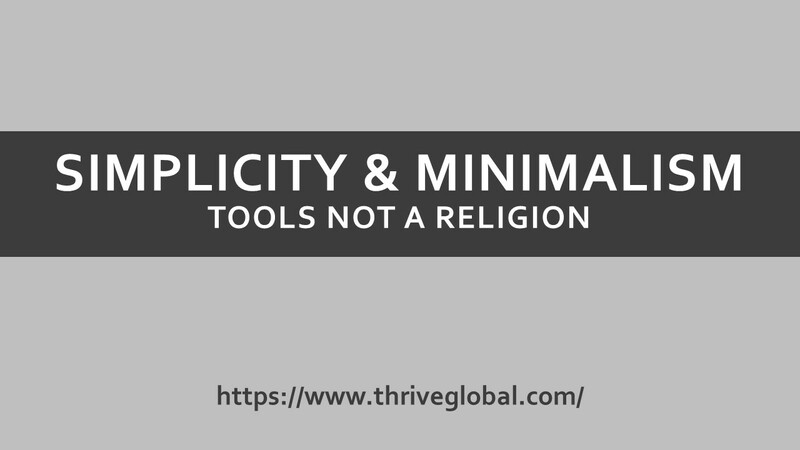 Last time I checked, neither living simply or minimalism was a religion. In fact, there is no final definition of what a minimalist really is. It’s open to interpretation and personal experimentation. All the better for it I say. There is some very cultish behaviour coming from some that should know better. Having 10 items in your wardrobe doesn’t necessarily make you a better person than someone that chooses to have 100 items in their wardrobe. Choosing not to have a car doesn’t mean you get to lord it up over those that do, or tell them they are ‘killing the planet’. Dressing in black and grey only so you don’t suffer ‘decision fatigue’ doesn’t make you a genius. Get a grip. You can of course choose to do any and all of these things, if it makes you happy and supports you living your version of a good life. Maybe you can inspire others to give it a go as well, but let’s drop the pretence that your way is superior. Leave the ego at the door please. It’s also become somewhat fashionable to call ourselves minimalists. Often without questioning what that actually means. Instagram shots of bare shelves, perfectly curated coffee on rustic wooden tables all hashtagged ‘minimalist’, ‘simpleisbest’ or the evergreen ‘lessismore’. Is this how we want to be remembered in 20 years? We dress in select colours only. We wear minimalist footwear. We count our possessions, somewhat obsessively. Not content with that, we tell everyone we are doing so and that they should do the same. Are we robots on a minimalist factory line all trying to look the same and repeat the same mantra or, are we individuals, looking for our version of simple? Simplicity and minimalism are tools and not necessarily the answer in themselves. It’s not an end point. We chase a simpler or more minimalist life for our own reasons. Maybe our lives have become too complicated and overwhelming. Or we want to intentionally declutter and make room for things that are important to us. Or perhaps we just want to free up time at work with a simpler approach to email, meetings and To Do lists so we feel less overwhelm. We need to find our own brand of simpler that fits the life we are happy living. That’s not necessarily always the version that we think we’ll be happy with when we start. Living simpler is a journey. What works for me will not necessarily be a good fit for you. With this in mind, we must experiment and own our version of simple. We can look to outside sources for inspiration but we don’t have to mirror all their choices. Simplicity, minimalism, 80/20 Living — they’re all powerful approaches that can aid us in life. They can all add much value. However, they can all mean vastly different things to each of us. We need to treat them accordingly. Used wisely, they can help us but maybe they are not the end destination in themselves. They are tools that should be kept in our toolbox for better living. Live simple certainly, but live simple on your own terms. Remove distractions, get to the core of what matters. Keep chipping away until you get to your own version of what’s best for you. Then put those tools back in the toolbox for another day.